The specific and consistent cluster of physiological symptoms of acoustic shock (AS) is consistent with TTTS, without underlying aural or TMJ pathology. ,, AS can occur involuntarily after exposure to a sudden unexpected loud sound perceived as highly threatening (acoustic incident). AS becomes an acoustic shock disorder (ASD) if symptoms persist. ,, AS was originally identified in call center staff, who are vulnerable to AS because of the increased likelihood of exposure near the ear(s) to an acoustic incident transmitted via a telephone headset. ,, The research on AS has focused on this cohort, however acoustic incidents can occur anywhere. AS aetiology triggering the onset of their tinnitus and/or hyperacusis. The selection criteria for this study included all consecutive tinnitus and hyperacusis patients consulting a clinician (otolaryngologist or audiologist) specialising in and trained to provide tinnitus/hyperacusis therapy. The study was conducted simultaneously in eight clinics over the survey period (between April and November 2010): Five clinics in Australia/New Zealand, two clinics in Brazil, one clinic in Spain. Despite some heterogeneity expected in the procedures adopted by each clinic, a detailed medical history, otoscopy and a hearing assessment were carried out on all patients. The degree of severity of tinnitus and/or hyperacusis in each ear. The participating clinics routinely used either the tinnitus reaction questionnaire (TRQ) or the tinnitus handicap inventory (THI) to evaluate tinnitus in their patients. Because different questionnaires were being used, each clinician was asked to categorize their patient's tinnitus and hyperacusis as mild or moderate or severe. All the clinicians involved in this study were experienced in tinnitus/hyperacusis evaluation and therapy, so it was considered reasonable to assume there would be consistency in these severity judgements, and in most cases the TRQ/THI score was also provided. Whether the tinnitus/hyperacusis onset had been triggered by exposure to an acoustic incident (a loud/sudden/unexpected/intolerable sound perceived as highly threatening) and if so, whether the acoustic incident was near one or both ears. A sensation of aural fullness or "blockage"
Whether the symptoms developed with loud/intolerable sound exposure or, if constantly present, were exacerbated by loud/intolerable sound exposure. Hearing assessment results, recorded in each ear as a 4 frequency average of hearing thresholds at 500 Hz, 1 kHz, 2 kHz and 4 kHz. A hearing loss was considered to be present if the 4 frequency average exceeded 20 dB. A hearing loss was further categorized as sensorineural, conductive, or due to noise damage. All patients were medically cleared of any outer ear, middle ear, inner ear, retrocochlear or TMJ dysfunction or pathology which could have caused these symptoms. Because of the possibility of an underlying pathology, those patients whose only symptoms were headache or disordered balance/vertigo or nausea or "muffled/distorted" hearing were not considered to have symptoms consistent with TTTS, and their symptom data was excluded. If the patient had a hearing loss, "distorted" and/or "muffled hearing" was excluded as a symptom consistent with TTTS unless it developed or was exacerbated by intolerable sound exposure. The total sample consisted of 345 patients, ranging in age from 11 to 97, with a mean age of 50.9. 179 of the total (51.9%) were male and 166 (48.1%) were female. 179 patients were from Australia/New Zealand (5 clinics), 113 from Brazil (2 clinics) and 53 from Spain (1 clinic). 8.4% (29/345) of patients had hyperacusis only (H group). Therefore, 91.6% (316/345) of patients in the total sample had tinnitus (T, T + H groups) and 50.7% (175/345) had hyperacusis (T + H, H groups). 53.8% (170/316) had tinnitus only (T group). 16.6% (29/175) had hyperacusis only (H group). 24.1% (83/345) patients reported having initially developed their tinnitus and/or hyperacusis following an acoustic incident trigger. Of those, 18.1% (15/83) patients had no symptoms consistent with TTTS, and 81.9% (68/83) patients had one or more symptoms consistent with TTTS [Figure 1]. Patients whose tinnitus/hyperacusis onset was triggered by an acoustic incident were highly statistically significantly more likely to develop symptoms consistent with TTTS (P < 0.001). Of the 75.9% (262/345) patients who did not develop their tinnitus and/or hyperacusis following an acoustic incident trigger, 46.9% (123/262) patients had no symptoms consistent with TTTS, and 53.1% (139/262) patients had one or more symptoms consistent with TTTS. Patients who developed symptoms consistent with TTTS were highly statistically significantly more likely to have had an acoustic incident triggering their tinnitus/hyperacusis onset than those who did not (P < 0.001) [Table 1]. AS was defined as an acoustic incident trigger for tinnitus/hyperacusis onset plus the presence of one or more symptoms consistent with TTTS. 12.4% (14/113) of patients in the clinics from Brazil. 83.8% (57/68) of AS patients had hyperacusis. 41.2% (114/277) of non-AS patients had hyperacusis. Patients with AS were highly statistically significantly more likely to have hyperacusis in comparison to the non-AS patients (P < 0.001) [Table 2]. 3.0% (1/33) had one or more bilateral symptoms of equal severity. 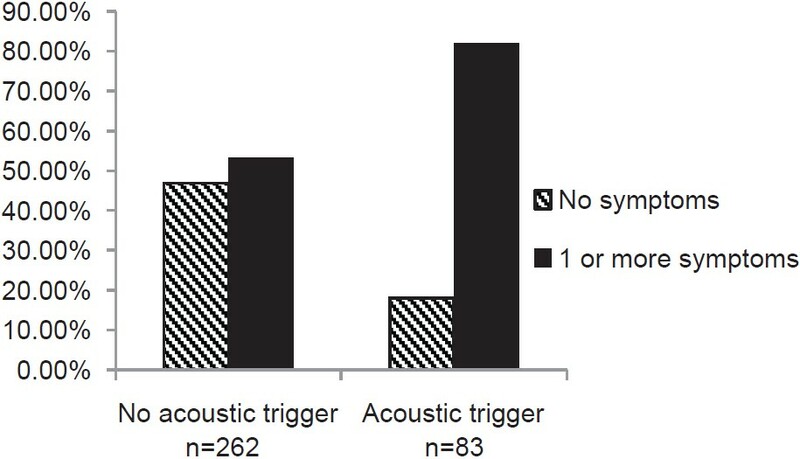 Therefore, 97% (32/33) of patients with a unilateral acoustic incident trigger for their AS had one or more symptoms consistent with TTTS to a greater degree on the affected side. Patients with a unilateral acoustic incident exposure triggering their AS were highly statistically significantly more likely to have one or more symptoms consistent with TTTS to a greater degree on that side (P < 0.001) [Table 3]. The likelihood was not quite as high (P < 0.080) for patients with a unilateral acoustic incident exposure to only have one or more symptoms on the affected side [Table 4]. 47.5% (164/345) of patients had ≥2 symptoms. Therefore, 60.0% (207/345) of patients in this sample had one or more symptoms consistent with TTTS [Figure 2]. A statistical test of independence of symptoms shows that the distribution of symptoms is significantly different from what would be expected if the symptoms were unrelated (P < 0.001). Patients with symptoms consistent with TTTS were significantly more likely to have ≥2 symptoms, rather than a single symptom [Table 5]. 31.2% (53/170) of patients had ≥2 symptoms. Therefore, 40.6% (69/170) of patients with tinnitus only (T group) had one or more symptoms consistent with TTTS [Figure 3]. 65.7% (115/175) of patients had ≥2 symptoms. 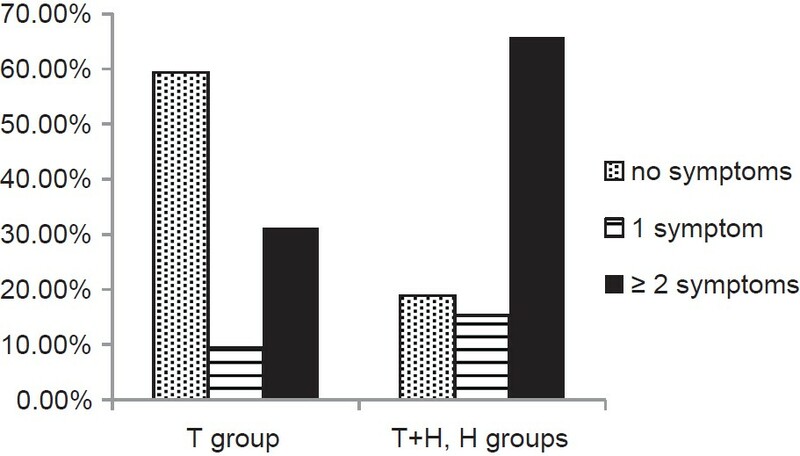 Therefore, 81.1% (142/175) of patients with hyperacusis (T + H, H groups) had one or more symptoms consistent with TTTS [Figure 3]. Patients with tinnitus only (T group) were highly statistically significantly more likely to have no symptoms consistent with TTTS than patients with hyperacusis (T + H, H groups) [Table 6]. Patients with hyperacusis (T + H, H groups) were highly statistically significantly more likely to report one or more symptoms consistent with TTTS than patients with tinnitus alone (T group) P < 0.001 [Table 7]. In view of the finding that patients with hyperacusis were more likely to report symptoms consistent with TTTS, patients reporting unilateral hyperacusis were analysed. 5.8% (3/52) of patients had no symptoms. Therefore, 84.6% (44/52) of patients with unilateral hyperacusis had one or more symptoms consistent with TTTS to a greater degree on the affected side. Patients with unilateral hyperacusis were highly statistically significantly more likely to have one or more symptoms consistent with TTTS to a greater degree on that side (P < 0.001) [Table 8]. The likelihood was not quite as high for patients with unilateral hyperacusis to only have one or more symptoms on the affected side (P = 0.070) [Table 9]. The most common symptoms for the total sample were aural fullness (33.0%); headache (21.2%); disordered balance (20.3%); TMJ pain (20.0%); pain along the side of the neck (20.0%); tympanic flutter (19.1%); dull ache in ear (19.1%); sharp pain in ear (17.7%); "muffled" hearing (12.5%); and "distorted" hearing (11.0%) [Table 10]. 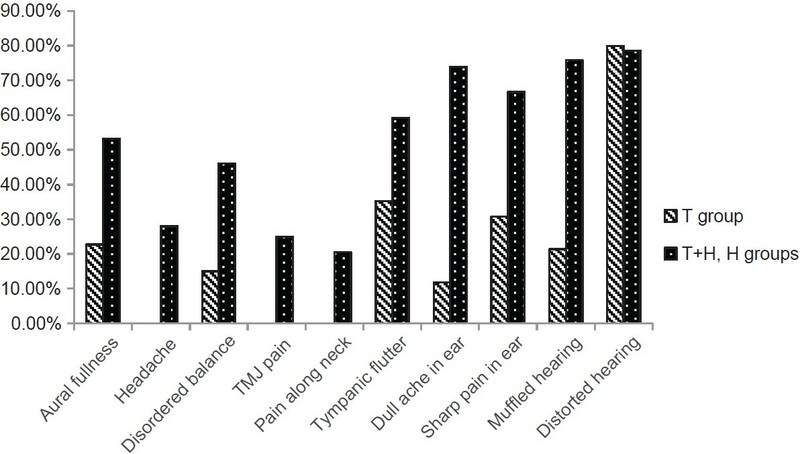 The most common symptoms for the tinnitus only patients (T group) were TMJ pain (14.7%); pain along the side of the neck (14.7%); headache (13.5%); aural fullness (12.9%); and disordered balance (11.8%) [Figure 4], [Table 10]. The most common symptoms for the hyperacusis patients (T + H, H groups) were aural fullness (52.6%); headache (28.6%); dull ache in ear (28.6%); disordered balance (28.6%); tympanic flutter (28.0%); sharp pain in ear (27.4%); TMJ pain (25.1%); and pain along the side of the neck (25.1%) [Figure 4], [Table 10]. Each symptom was statistically more likely to be present in those patients with hyperacusis (T + H, H groups), in comparison to those with tinnitus alone (T group). This difference was highly statistically significant (P < 0.001) for symptoms of: Aural fullness, headache, disordered balance, tympanic flutter, dull ache in the ear and sharp pain in ear [Table 10]. Each clinician was asked to categorise their patient's tinnitus and hyperacusis as mild or moderate or severe. The sample was broken into two groups, with tinnitus and hyperacusis severity rated and analysed separately. The total number of patients with tinnitus (T, T + H groups) was 316/345. Tinnitus severity was rated as mild, moderate or severe. 29.7% (30/101) of patients had ≥2 symptoms. Therefore, 42.6% (43/101) of patients with mild tinnitus had one or more symptoms consistent with TTTS [Figure 5]. 54.8% (63/115) of patients had ≥ 2 symptoms. Therefore, 67.8% (78/115) of patients with moderate tinnitus had one or more symptoms consistent with TTTS [Figure 5]. 58% (58/100) of patients had ≥2 symptoms. Therefore, 68% (68/100) of patients with severe tinnitus had one or more symptoms consistent with TTTS [Figure 5]. Patients with tinnitus were highly statistically significantly more likely to have two or more symptoms consistent with TTTS as their tinnitus severity increased (P < 0.001) [Table 11]. The total number of patients with hyperacusis (T + H, H groups) was 173/345 (the severity data had not been recorded on two patients, so they were omitted). Hyperacusis severity was rated as mild, moderate or severe. 53.1% (34/64) of patients had ≥2 symptoms. 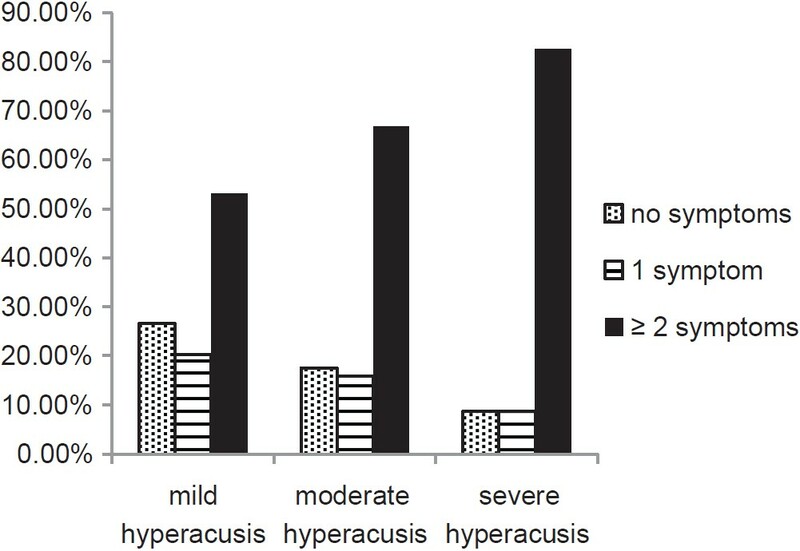 Therefore, 73.4% (47/64) of patients with mild hyperacusis had one or more symptoms consistent with TTTS [Figure 6]. 66.7% (42/63) of patients had ≥2 symptoms. Therefore, 82.5% (52/63) of patients with moderate hyperacusis had one or more symptoms consistent with TTTS [Figure 6]. 82.6% (38/46) of patients had ≥2 symptoms. Therefore, 91.3% (42/46) of patients with severe hyperacusis had one or more symptoms consistent with TTTS [Figure 6]. The more severe the hyperacusis, the more likely the patient would have ≥2 symptoms consistent with TTTS. However, as the prevalence of symptoms consistent with TTTS is high for all hyperacusis patients, the differences between the mild, moderate and severe hyperacusis groups are less significant (P = 0.032) [Table 12]. 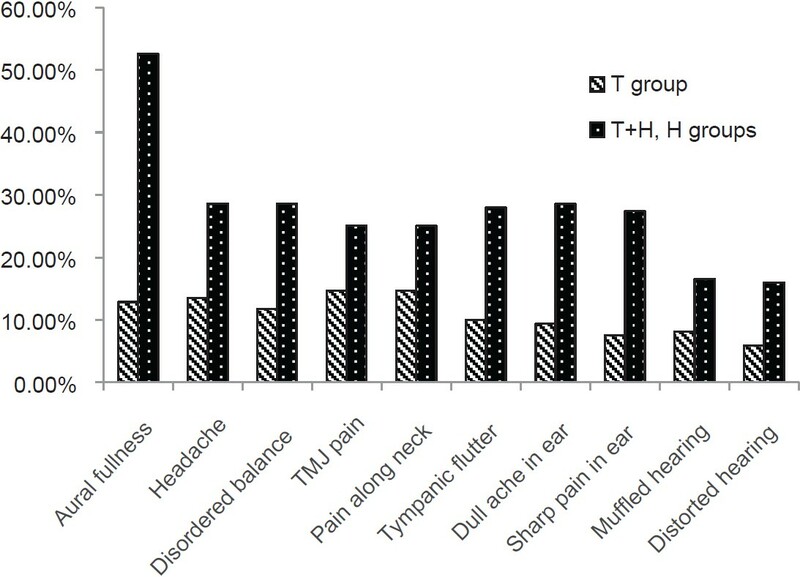 [Figure 7] shows the prevalence of specific symptoms consistent with TTTS, which developed or, if frequently or constantly present, were exacerbated by loud/intolerable sound exposure, in tinnitus only patients (T group) compared to hyperacusis patients (T + H, H groups). Patients with hyperacusis (T + H, H groups) with symptoms consistent with TTTS of: Aural fullness, headache, disordered balance, TMJ pain, pain along the side of the neck, dull ache in the ear and sharp pain in the ear were significantly more likely than patients with tinnitus only (T group) to have their symptoms develop or become exacerbated by intolerable sound exposure. This difference was highly statistically significant for symptoms of headache (P < 0.001), dull ache in ear (P < 0.001), muffled hearing (P = 0.001) and TMJ pain (P = 0.005) [Table 13]. 52.6% (91/173) of patients had ≥2 symptoms. Therefore, 64.16% (111/173) patients with normal hearing had one or more symptoms consistent with TTTS [Figure 8]. 45.4% (78/172) of patients had ≥2 symptoms. Therefore, 58.1% (100/172) of patients with a hearing loss had one or more symptoms consistent with TTTS [Figure 8]. There was no significant difference (P = 0.4) in the prevalence of symptoms consistent with TTTS in patients with normal hearing and in those with a hearing loss [Table 14]. In this sample of tinnitus and hyperacusis patients attending the eight participating clinics, 49.3% of patients had tinnitus only, 42.3% of had tinnitus plus hyperacusis and 8.4% of patients had hyperacusis only. 91.6% of patients in the total sample had tinnitus and 50.7% had hyperacusis. Of those patients with tinnitus, 46.2% had tinnitus plus hyperacusis and 53.8% had tinnitus only. Of those patients with hyperacusis, 83.4% had tinnitus plus hyperacusis and 16.6% had hyperacusis only. In this study, statistical analysis of the symptoms consistent with TTTS supports their belonging to a cluster or syndrome [Table 5]. A statistical test of independence of symptoms shows that the distribution of symptoms consistent with TTTS is significantly different from what would be expected if the symptoms were unrelated (P < 0.001). Additionally, patients with these symptoms were significantly more likely to have ≥2 symptoms, rather than a single symptom. 24.1% of the cohort reported having initially developed their tinnitus and/or hyperacusis following exposure to a sudden unexpected loud sound perceived as highly threatening (acoustic incident). Of those, 81.9% reported one or more symptoms consistent with TTTS [Figure 1]. Patients whose tinnitus/hyperacusis onset was triggered by an acoustic incident were highly statistically significantly more likely to develop one or more symptoms consistent with TTTS (P < 0.001). Conversely, patients who developed one or more symptoms consistent with TTTS were more likely to have had an acoustic incident triggering their tinnitus/hyperacusis onset than those who did not (P < 0.001) [Table 1]. AS was defined as an acoustic incident trigger for tinnitus/hyperacusis onset plus the presence of one or more symptoms consistent with TTTS. AS was identified in 19.7% (68/345) of this sample and in all the participating countries, indicating that AS is a universal phenomenon. Much of the AS research has been carried out in Australia, and the higher prevalence of AS in the clinics from Australia/New Zealand (26.3% of their total) in comparison to the clinic from Spain (13.2%) and the clinics from Brazil (12.4%) reflects an increased level of AS awareness, diagnosis and referral for evaluation/therapy among tinnitus/hyperacusis clinicians, the medical profession and in the community. 83.8% of AS patients had hyperacusis. 41.2% (114/277) of non-AS patients had hyperacusis. Patients with AS were highly statistically significantly more likely to have hyperacusis in comparison to the non-AS group (P < 0.001, [Table 2]). 97% (32/33) of patients with a unilateral acoustic incident trigger for their AS had one or more symptoms consistent with TTTS to a greater degree on the affected side (P < 0.001, [Table 3]). One or more symptoms consistent with TTTS were reported in 60% (207/345) of the total sample [Figure 2]. This is a substantial finding, at the very least reflecting the likelihood of symptom-related annoyance in many tinnitus and hyperacusis patients, and for a large number representing significant levels of suffering, anxiety and distress. While a substantial proportion of the total sample report symptoms consistent with TTTS, these results indicate a particularly strong association between hyperacusis and the development of symptoms. One or more symptoms consistent with TTTS were reported in 81.1% of those patients with hyperacusis and in 40.6% of those with tinnitus only [Figure 3], [Table 6] and [Table 7]. This was a highly statistically significant difference between tinnitus only and hyperacusis patients (P ≤ 0.001). 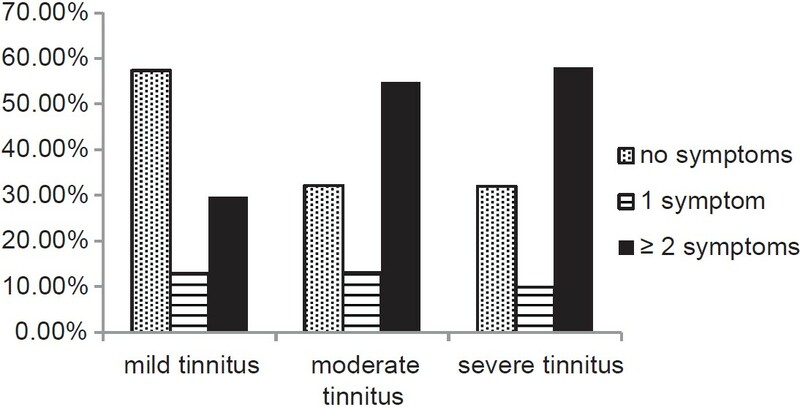 The more severe the tinnitus and hyperacusis, the more likely the patient would report symptoms consistent with TTTS [Figure 5] and [Figure 6], [Table 11] and [Table 12]. 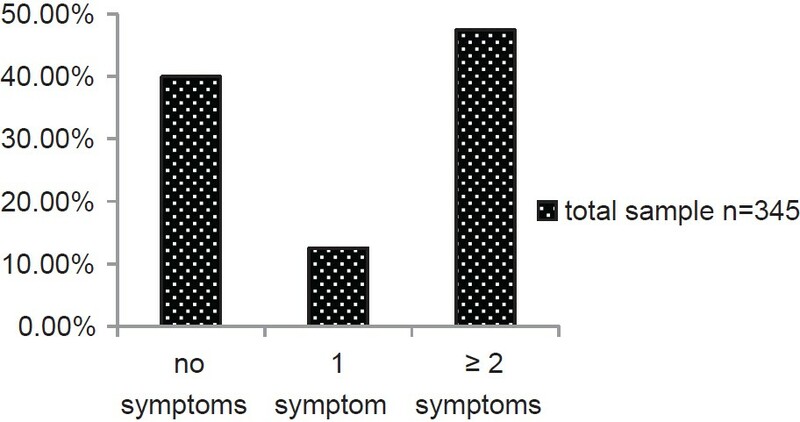 Almost all patients (91.3%) with severe hyperacusis report at least one symptom consistent with TTTS, and 82.6% report ≥ 2 symptoms [Figure 6]. An interesting finding in this study was that patients with unilateral hyperacusis were highly statistically significantly more likely to have one or more symptoms consistent with TTTS to a greater degree on that side (P < 0.001, [Table 8]). Many patients with symptoms consistent with TTTS, particularly those with hyperacusis, reported that their symptoms developed or, if frequently or constantly present, were exacerbated by loud/intolerable sound exposure [Figure 7], [Table 13]. For example, for those patients with the most common symptom of aural fullness (n = 114 or 33.0% of the total sample), 22.7% of tinnitus only patients and 53.3% of hyperacusis patients reported that this symptom develops or is exacerbated by intolerable sound exposure. People with moderate/severe hyperacusis are likely to find a proportion of everyday sounds unpleasant, difficult to tolerate or intolerable. Hyperacusis patients with symptoms consistent with TTTS of: Aural fullness, headache, disordered balance, TMJ pain, pain along the side of the neck, dull ache in the ear and sharp pain in the ear were significantly more likely than patients with tinnitus only to have their symptoms develop or become exacerbated by loud/intolerable sound exposure. This difference was highly statistically significant for symptoms of headache, dull ache in ear, muffled hearing and TMJ pain [Table 13]. A higher prevalence of aural pain (dull ache in ear 28.6%; sharp pain in ear 27.4%) was reported by hyperacusis patients in this sample [Table 10], compared to the 12.5% of persons with hyperacusis reporting pain in the prevalence study conducted by Andersson et al. The hyperacusis patients in this sample were sufficiently affected by their tinnitus and/or hyperacusis to seek therapy, whereas those in Andersson's sample had responded to an online questionnaire or were randomly contacted by post. Subjective symptoms of "muffled" hearing (when the patient reports a fluctuating hearing loss, but their test results indicate normal or stable hearing); and "distorted" hearing (any fluctuating change in clarity of hearing) are likely to be due to the minor alterations in the middle ear impedance associated with TTTS. The results for hyperacusis patients show that 78.6% with "distorted" hearing and 75.9% with "muffled" hearing reported that these symptoms developed or were exacerbated by intolerable sound exposure [Table 13]. While these symptoms were less common in patients with tinnitus only, 80.0% with "distorted" hearing reported that it developed or was exacerbated by intolerable sound exposure. The unilateral preponderance of symptoms in patients with unilateral hyperacusis and those who reported exposure to a unilateral acoustic incident exposure triggering their AS. 84.6% of patients with unilateral hyperacusis had one or more symptoms consistent with TTTS to a greater degree on the affected side (P < 0.001) [Table 8]. 97.0% (32/33) of patients with a unilateral acoustic incident trigger for their AS had one or more symptoms consistent with TTTS to a greater degree on the affected side (P < 0.001) [Table 3]. 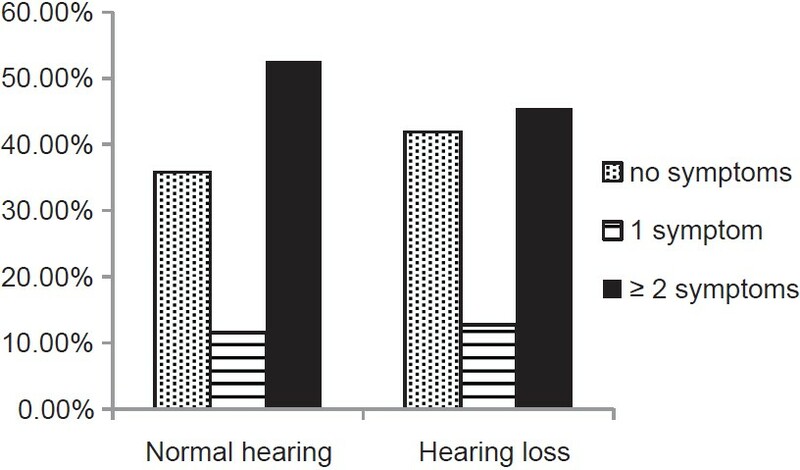 The results showed there was no significant difference in the prevalence of symptoms consistent with TTTS in patients with normal hearing and in those with a hearing loss [Figure 8], [Table 14], so further analysis of sensorineural, conductive, or noise damage aetiology was not carried out. A hearing loss was considered to be present if the 4 frequency average of hearing thresholds at 500 Hz, 1 kHz, 2 kHz and 4 kHz exceeded 20 dB. While a hearing assessment typically includes obtaining hearing thresholds up to 8 kHz, this 4 frequency average is a standard method in clinical audiological practice for calculating the presence of a hearing loss. It is acknowledged, however, that tinnitus and hyperacusis patients with a hearing loss for the higher frequencies only will be missed using this criterion. Further studies investigating the presence of a hearing loss for the high frequencies in greater depth are recommended to fully explore any link between hearing loss and the presence of symptoms consistent with TTTS. Ramirez-Aristeguieta et al. have investigated the anatomical and physiological connections in TMD patients with secondary aural symptoms and the central and peripheral mechanisms involved. ,, The authors carried out a meta-analysis of data from 12,436 patients in 49 peer-reviewed publications, proposing a range of muscular, bone communication and neural scenarios to explain the relationship between aural symptoms (otalgia, tinnitus, vertigo, subjective hearing loss and aural fullness) exacerbated by dysfunctional mouth and jaw dynamics. They placed a strong emphasis on tensor tympani muscle involvement and associated trigeminal nerve dysfunction. The tensor tympani muscle is innervated by the motor portion of the mandibular branch of the trigeminal nerve, and the authors consider that TTTS can lead to, and in an efferent pathway be caused by, an abnormal stimulation of the trigeminal nerve. This can lead to a chronic irritation of the trigeminal nerve, as well as other cranial and cervical sensory nerves of the ear and periauricular region. Central sensitization can develop from the resultant chronic pain, leading to an expansion of the perceived peripheral pain and resulting in the typical symptoms of severe TMD. The presence of symptoms consistent with TTTS, including TMJ pain, does not imply TMJ dysfunction, as shown in this patient sample who were medically cleared of aural and TMJ pathology or dysfunction. These findings suggest an alternative etiologic pathway triggering TTTS as a primary phenomenon in tinnitus, hyperacusis and ASD patients in comparison to secondary TTTS in patients with TMD and/or TMJ dysfunction. The potential severity and persistence of symptoms consistent with TTTS in ASD patients has significant clinical and medico-legal implications. The global growth of call centres can be expected to lead to an increase in ASD prevalence. Andersson and Baguley postulated that fear of the pain experience is one of the factors playing a significant role in explaining avoidance of sounds by people with hyperacusis. Their observation that some of their hyperacusis clients suffer tremendous fear of any situation where they risk sound-induced pain will be familiar to clinicians providing hyperacusis therapy. , However, Andersson and Baguley did not offer an explanation for the physiological basis of this pain. In this sample, 74.0% of hyperacusis patients with the symptom of dull ache in the ear and 66.7% of hyperacusis patients with the symptom of sharp pain in the ear reported these symptoms developed or were exacerbated by loud/intolerable sound exposure [Table 13]. These patients can readily believe that their ears are no longer able to physically tolerate these sounds, or that these sounds are causing damage to their ears or hearing, and should be avoided. This unpleasant consequence of exposure to sounds perceived as intolerable and the threat of further exposure is likely to play a significant role in tinnitus escalation and the development, persistence and escalation of hyperacusis. Loudness discomfort levels (LDLs) are in general use as a measure of hyperacusis as well as tracking the efficacy of hyperacusis desensitisation therapy. For patients with moderate/severe hyperacusis, exposure to sounds at their loudness tolerance limits is threatening and unpleasant. This can affect the accuracy of the results obtained, as well as potentially kindling an increase in their tinnitus, hyperacusis and symptoms consistent with TTTS. Documenting the presence of symptoms consistent with TTTS and tracking a reduction in symptoms over time offers a less invasive method than LDL testing for assessing hyperacusis severity and evaluating the efficacy of hyperacusis desensitisation therapy. The high prevalence of symptoms consistent with TTTS in this sample suggests they can readily develop as a primary phenomenon in patients with tinnitus, and more particularly in those with hyperacusis. These results support a central relationship between tinnitus, hyperacusis and TTTS, with further research indicated to explore this relationship and the efferent pathway triggering TTTS. TTTS offers an explanation for the aural pain reported by many hyperacusis patients, often triggered or aggravated by intolerable sound exposure. Symptoms consistent with TTTS are subjective and can cause high levels of anxiety. This can lead to tinnitus escalation, the development and escalation of hyperacusis, and limit the efficacy of tinnitus/hyperacusis therapy. These symptoms should be routinely evaluated in history taking, de-mystified to patients to provide reassurance, and treated accordingly. These results indicate that AS is a world-wide phenomenon, with significant clinical, medico-legal and military diagnostic/rehabilitation implications. It is recommended that evaluation of an acoustic incident at the time of tinnitus/hyperacusis onset is routinely carried out in history taking with tinnitus and hyperacusis patients. Preliminary findings from this study were presented orally and in electronic poster form at the X th International Tinnitus Seminar, Florianopolis, Brazil March 2011. The authors would like to acknowledge the Scientific Committee for selecting it as the best poster, winning the inaugural Jack Vernon Award for originality, innovation, study design, analysis and ultimate impact on the field of tinnitus. 1. Milhinch J. Acoustic shock injury: A report on injury following acoustic incidents in call centres. Melbourne: 2001. 2. Patuzzi R. Acute aural trauma in users of telephone headsets and handsets. In: Ching T, editor. Abstracts of XXVI International Congress of Audiology. (Spec ed). Melbourne. Aust N Z J Audiol 2002;23:2:132. 3. Westcott M. Acoustic shock injury (ASI). Acta Otolaryngol Suppl 2006;556:54-8. 4. Ramírez LM, Ballesteros LE, Sandoval GP. Tensor tympani muscle: Strange chewing muscle. Med Oral Patol Oral Cir Bucal 2007;12:E96-100. 5. Klockhoff I. Middle ear muscle reflexes in man. A clinical and experimental study with special reference to diagnostic problems in hearing impairment. Acta Otolaryngol Suppl 1961;164:1-92. 6. Klockhoff I. Tensor tympani syndrome: A source of vertigo. Uppsala: Meeting of Barany Society; 1978. 8. Klockhoff I. Impedance fluctuation and a tensor tympani syndrome. In: Proceedings of the 4th International Symposium on Acoustic Measurements. Lisbon; 1979. p. 69-76. 9. Westcott M. Acoustic shock disorder. Tinnitus discovery-Asia and pacific tinnitus symposium, Auckland, September 2009. NZMJ 2010;123:p25. 10. Ramirez LM, Ballesteros LE, Sandoval GP. Topical review: Temporomandibular disorders in an integral otic symptom model. Int J Audiol 2008;47:215-27. 11. Ramirez Aristeguieta LM, Ballesteros Acuña LE, Sandoval Ortiz GP. Tensor veli palatini and tensor tympani muscles: Anatomical, functional and symptomatic links. Acta Otorrinolaringol Esp 2010;61:26-33. 12. Riga M, Xenellis J, Peraki E, Ferekidou E, Korres S. Aural symptoms in patients with temporomandibular joint disorders: Multiple frequency tympanometry provides objective evidence of changes in middle ear impedance. Otol Neurotol 2010;31:1359-64. 13. Jastreboff PJ, Hazell J. Tinnitus Retraining Therapy. Cambridge: Cambridge University Press; 2004. p. 206. 14. Douglas CR, Avoglio JL, de Oliveira H. Stomatognathic adaptive motor syndrome is the correct diagnosis for temporomandibular disorders. Med Hypotheses 2010;74:710-8. 15. McKenna L, Baguley D, McFerran D. Living with Tinnitus and Hyperacusis. London: Sheldon Press; 2010. p. 23. 16. Baguley DM, Andersson G. Hyperacusis: Mechanisms, Diagnosis, and Therapies. San Diego: Plural Publishing; 2007. p. 12-3, 15. 17. Anari M, Axelsson A, Eliasson A, Magnusson L. Hypersensitivity to sound: Questionnaire data, audiometry and classification. Scand Audiol 1999;28:219-30. 18. Thompson AM, Thompson GC, Britton BH. Serotoninergic innervation of stapedial and tensor tympani motoneurons. Brain Res 1998;787:175-8. 19. Schames J, Schames M, Boyd JP, King EL, Ulansey S. Trigeminal pharyngioplasty: treatment of the forgotten accessory muscles of mastication which are associated with orofacial pain and ear symptomology. AJPM 2002;12:102-12. 20. Folmer RL, McMillan GP, Austin DF, Henry JA. Audiometric thresholds and prevalence of tinnitus among male veterans in the United States: Data from the national health and nutrition examination survey, 1999-2006. J Rehabil Res Dev 2011;48:503-16. 21. Westcott, M. Tonic Tensor Tympani Syndrome - an explanation for everyday sounds causing pain in tinnitus and hyperacusis clients. Proceedings of IXth International Tinnitus Seminar, Gothenburg 2008, Poster, p69. 22. M. Hyperacusis: A clinical perspective on management. Tinnitus discovery-Asia and pacific tinnitus symposium, Auckland, September 2009. NZMJ 2010;123:p154. 1 Inner ear symptoms: can we use them to approach cardiovascular diseases?